Sinn Fein is the big loser from the Irish presidential election. Presented with a golden opportunity to set itself out as the principal alternative to a Fine Gael, Fianna Fail, Labour triumvirate, Mary Lou McDonald’s party offered the Republic’s electorate a package so bland that it blended in with the wallpaper. Surely someone in Sinn Fein must now be asking how the Movement has strayed so far from its core base. Did they really think that they could succeed by wooing the middle-class, a strategy that failed miserably in the past for both Labour and the Workers Party? The choice of Liadh Ní Riada was not the cause of their problem. It was the thinking that led them to choose Ms Ní Riada that lies at the heart of her and the party’s rejection. Misreading the political situation and believing that rebranding as a middle-of-the-road, conviction-less, liberal, soft on business but above all no-longer-Provo organisation would seal the deal was a major blunder. Moreover, this misconception did not start with the presidential election. The party that was caught flat-footed at the beginning of the anti water tax campaign, has changed direction on the EU, with all that implies for its economic outlook. In a two-tier economy there is no middle ground. Unable to decide which side of the fence to stand on has opened the door to the type of Trump-like populism that took Peter Casey from obscurity to winning 23% of votes cast in the recent election. The need to continue constructing a dynamic socialist republican mass movement remains an imperative. It was a forgery created by Conservative Party supporters in British intelligence; but their ploy worked. The political middle ground collapsed, the Tories won the election, and so ended any prospect of détente with the Soviet Union. Not, of course, that this was the only act of political sabotage ever conducted by British spooks. From Pigott’s forged Parnell letter to Tony Blair’s infamous dossier alleging Iraqi “weapons of mass destruction,” England’s secret services have never allowed the truth to get in the way of a reactionary political agenda. With this in mind we can consider more recent circumstances and events. The leader of the British Labour Party, Jeremy Corbyn, has defied right-wing expectations that he would self-destruct and has instead reinvigorated left-wing social democracy by challenging Blairite and Tory-manufactured austerity. Though far from revolutionary, his proposals if implemented would challenge neo-liberalism, and not only in Britain. Moreover, if Corbyn’s party were to record a reasonable measure of success at the coming local government elections on 3 May his progress towards occupying No. 10 Downing Street might be unstoppable. 2. See Joseph de Burca, “The dark side of the media: Secret service penetration of British media (and attempts to infiltrate one Irish medium),” Village, 26 March 2018. 3. “Multinationals pay lower taxes than a decade ago,” Financial Times, 11 March 2018. While it is important that seminal events are remembered, it is also necessary that we learn from them. There are lessons from that era that are not only of historical interest but have relevance to contemporary Ireland and its relationship with the rest of the world. The celebration on 26th January 2019 in Liberty Hall, therefore, will go beyond a simple commemoration: it will also explore the progress, or lack of it, since then and ask participants to contribute towards making a positive and progressive impact in the days to come. The dogma of free-market capitalism is ruthlessly implemented, with little care for its effect on working people. There is a housing and homelessness crisis, with the neo-liberal Irish state, in spite of an obvious emergency, insisting on the provision of houses through the private sector, notwithstanding the abject failure of this policy. Lengthy hospital waiting-lists, and the spectacle of patients parked for hours on trolleys, is a national disgrace. Exacerbating difficulties within the health service is the absence of adequate provision of home help for the elderly. Nevertheless, this state persists with the detrimental practice of maintaining a parallel private and public health service. Whereas once the capitalist state provided a protective structure whereby an elite would profit from manufacturing and finance, this has now become a situation where the state also ensures that a favoured few benefit by being paid handsomely to manage public services. In the process, standards are frequently lowered, trade unions are often expelled, and ultimately, if privatised, the management fails, as Carillion and others have done, with the taxpaying public picking up the bill. Illustrating the sheer mendacity of this regime was the astonishing spectacle last year of an Irish government refusing to accept €13 billion in taxes owed by the enormously wealthy Apple Corporation. In the light of all this it is reasonable to ask whether a sovereign Irish republic as asserted in the Mansion House ninety-nine years ago exists in any real sense in Ireland today. In the first place, a raft of restrictions is imposed on the popular will as a consequence of membership of the European Union. This can only get worse if proposals for closer integration, coupled with the strengthening of the euro zone, are implemented. Moreover, it is likely that this will come about, since the Davos poster-boy Emmanuel Macron is proposing this very package and has recently been receiving backing form the supine leadership of Germany’s Social Democratic Party. Let us not be complacent either, because this situation has a resonance beyond national pride. The Bulletin of the Atomic Scientists has moved its symbolic Doomsday Clock to two minutes before midnight,² thanks largely to the “unpredictability” of Donald Trump. Compromising neutrality, therefore, poses a risk that Ireland could be dragged almost unwittingly into an imperial war. Doing this, however, requires the building of a regularly convened assembly or arena designed with the intention of identifying and promoting a comprehensive programme capable of transforming Irish society. What the assembly would be named, how it would be made up or where it might be convened are matters for democratic agreement and are not a prerogative reserved by the Peadar O’Donnell Forum. 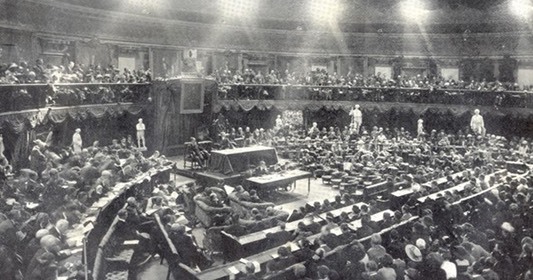 What the forum does insist upon, though, is that a hundred years after the first Dáil the Irish working class must be allowed to realise the promise and potential of that assembly’s Democratic Programme. 1. Paul Mason, “Ink it onto your knuckles: Carillion is how neoliberalism lives and breathes,” Novamedia, 15 January 2018. 2. “Doomsday Clock moved to just two minutes to ‘apocalypse’,” BBC News, 25 January 2018. 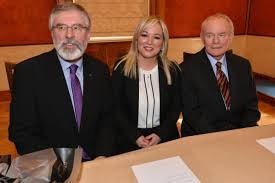 The announcement of his retirement by Sinn Fein’s long-serving president Gerry Adams was deemed by the media to be the most noteworthy happening at the party’s recent ard-fheis. After 34, often turbulent years at the helm of a movement, ridiculed and lauded in almost equal parts, it could hardly have been otherwise. The Adams tenure has had a significance that goes well beyond his own organisation. No matter how one views the man, it is impossible to deny the impact he has had on Irish politics over the past decades. Under his stewardship, Sinn Féin not only emerged from the shadow of the IRA but has become a formidable electoral force both north and south. Yet in spite of media focus, it was another decision taken at the annual convention that will have greater significance in the days to come. 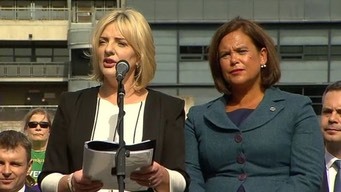 Sinn Fein’s declared willingness to participate as a minority partner in a coalition government in Dublin has ramifications that go beyond the party. Taken at a time when it might reasonably have been anticipated that an incoming leader would have had time to adjust, the latest brouhaha involving Francis Fitzgerald and the Department of Justice has hastened developments. 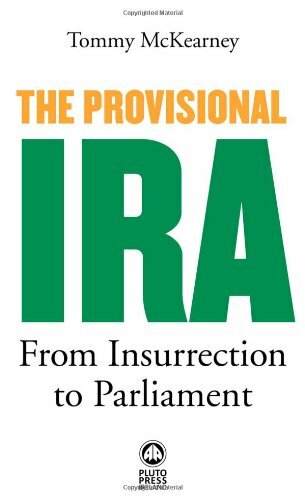 For over a decade, Sinn Fein has straddled a position somewhere between radicalism and reformism. There was doubt as to whether the party was vying to replace Fianna Fáil as ‘the republican party’ or attempting to introduce discipline to that fragmented radical community inside and outside the Dail. Signalling an intent to enter government as a junior partner in a coalition resolves this conundrum and is a clear indication of a determination to conform within establishment parameters. Although the Fine Gael led coalition will survive the latest upheaval, the longevity of this government must be in doubt. The high-wire game of bluff between Varadkar and Martin has damaged confidence between Fine Gael and Fianna Fáil and questions the durability of the confidence and supply arrangement. While opinion polls are currently suggesting little change in the event of an election, it is possible that post-polling-day arithmetic could present the option for a Fianna Fáil/Sinn Fein administration. 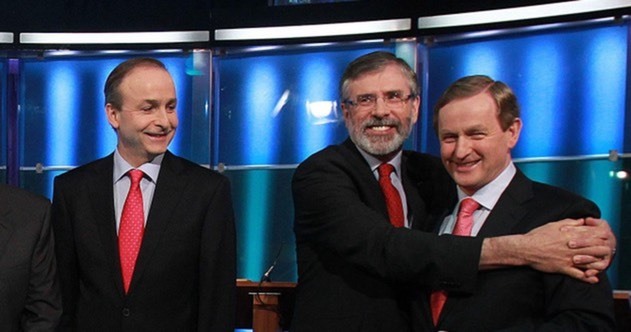 Have no doubts either about Micheál Martin’s position vis a vis coalition. Faced with the temptation of entering office or underwriting the inevitable mess of a hung Dail and the risk of yet another election, Michael Martin will accept Mary Lou McDonald as his Tánaiste. While it is reasonable to point to the failure of other minority partners in coalition arrangements as an indication of where Sinn Fein would find itself, this is almost to miss the point. The bourgeois parliamentary system is created for self perpetuation. In other words, it is not a question of whether those in cabinet are of sterling character or unbending republican principle. In the final analysis it is down to the role of the state in capitalist society where as James Connolly said, governments are but committees of the rich to manage the affairs of the ruling class. Let’s be clear on this point. Connolly’s observation is not some outdated piece of left-wing hyperbole. No serious political observer believes that the cabinet exercises absolute power in the Republic of Ireland. In the first instance, the Dail gives way to the constitution guaranteeing the right to private property and this will be upheld by the judiciary restricting elected deputies ability to redistribute wealth. 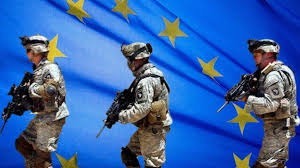 Then there the state’s subjugation to the European Union which in effect amounts to conceding a large measure of economic sovereignty to Brussels. Moreover, huge influence is exercised covertly by other agencies such as the privately owned media, financial sector entities, speculators and foreign multinationals. The outworking of this is that a minority partner in a coalition government will have little ability to make meaningful change and in reality smaller parties change well before the state’s free-market system begins to creak. This analysis should not be taken as simply another swipe at Sinn Fein but rather as an assessment of the wider political situation in Ireland at present. The decision to accept a junior partnership role in coalition has reverberations across the political spectrum. Around us there are grave issues demanding solutions as all the while we are witnessing a vacant space on the left highlighted by the latest Sinn Fein decision, coupled with the Labour Party’s decline. Meanwhile, there is a real erosion of credibility in the state apparatus. How can it be otherwise as key institutions are faltering and urgent responsibilities neglected or discarded. Look at what is happening with one of the basic elements required for the exercise of state power; control of the administration of justice and policing. Chaos reigns unchecked in both these areas. The Department of Justice is apparently unable to exercise authority and cannot manage itself or its emails. Running parallel with the department’s woes are a series of seemingly unresolvable scandals within the Garda Siochana that has eroded the force’s prestige in the eyes of all but dyed in the wool right wingers. If that’s not enough, the state’s two largest parties have sweated hard and long to agree a sweetheart deal for reasons of political expediency, rather than sack the minister of justice for obvious incompetence. Adding further to the state’s ebbing authority is a raft of social problems. Housing shortages remain at crisis point with every indication that the situation will get worse. Austerity continues to hurt many working class families who see little opportunity to escape its grip. Zero-hour contracts, depressed wages, a diminishing welfare safety net and reduced social wage make life increasingly difficult in a lot of households. Moreover, addressing these social and economic problems is rendered virtually impossible by the Republic’s ruling class’ slavish adherence to the European Union and its neoliberal dictates. Against this backdrop of damaged state credibility and widespread social disadvantage, there is space and need for a clearly defined left movement. The Irish Labour Party is in disarray while Sinn Fein is edging irreversibly towards centrist social democracy. The field is, therefore, opening up for a genuine socialist alternative and signs are that this is now a real possibility. For example, left-wing trade unionists in the Right to Change movement are exploring options in this field. Positive signals are also coming from some smaller political parties and elected representatives as they combine in the Campaign for Public Housing. Meantime, the Peadar O’Donnell Socialist Republican Forum continues to provide an arena for political discussion facilitating the development of an ideological consensus around a programme for progressive transformative change. Nevertheless, nothing changes without a conscious and coherent effort and we must not forgo this opportunity to make progress. It would be unforgivable if we fail to measure up to the requirements of the new day. We must, as civil rights activists said in the 1960s, ‘Seize the Time’. 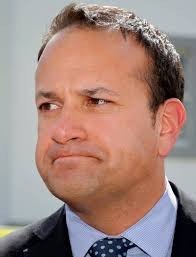 Just as we were beginning to think that things couldn’t get much worse, we are now faced with the nasty prospect of Leo “people who get up early in the morning” Varadkar becoming Taoiseach. During a pitch for the leadership of Fine Gael, he made his right-wing credentials crystal-clear, claiming that “unfortunately there are a group of people, very often supporters of the far left, that believe they shouldn’t pay anything and that Apple, bondholders or billionaires should pay . . .” Adding to this crude piece of neo-liberal dogma, he stated that if selected as party boss he would curb the right to strike in certain circumstances, by introducing binding arbitration on trade unions—the thin end of a wedge designed to emasculate organised labour. Notwithstanding the fact that she is a politician of considerable experience and ability as outgoing minister for health in the Stormont Assembly, she faces several difficult challenges. Not only has she a short preparatory period before leading the party into an election in early March but she will be faced immediately thereafter with what are bound to be fraught negotiations with the DUP over the establishment of an Executive—and that may prove to be the easy bit. The fundamental problem facing all political parties in Northern Ireland is not restoring the institutions but what to do with a failed political entity, locked helplessly within the United Kingdom. Although there may be some small degree of electoral slippage for both major parties, Sinn Féin and the DUP are likely to remain the two largest groups in the Assembly. Thanks to the limited ability of the Stormont opposition, not to mention the absence of a visible alternative beyond that institution, the previous coalition partners will emerge as the only contenders for executive office. Whatever the electoral tally may show, there is undoubtedly a wide gap to be bridged if an Executive is to be formed in the weeks following 2 March. Sinn Féin has been stung by criticism from its own supporters for its inept and often contradictory early-days handling of the “cash for ash” scandal. The party was reluctant to bring down the Assembly and felt angry when forced to do so and thus trigger an election. Michelle O’Neill will be obliged, therefore, to wring some noticeable concessions from the DUP before re-entering coalition. Arlene Foster, on the other hand, has practically staked her reputation on acting tough with Sinn Féin while simultaneously rejecting any responsibility whatsoever for the RHI fiasco. This indicates the likelihood of stalemate, followed by direct rule, for some months at least. There was a time in the not too distant past when both London and Dublin would have reacted with some alarm to the prospect of relations between Northern Ireland’s political parties breaking down. Not any longer, though. Put bluntly, there is virtually no prospect of this rupture in the Assembly leading to widespread armed activity, and at any rate the Irish and British governments are now wrestling with what both consider the much more important issue of Brexit. Consequently, the quarrelsome Northern politicians will be left on the back burner until Theresa May finds time to send someone in to force through a settlement. No doubt an arrangement of sorts will be reached sooner or later. Both parties are acutely aware of what may happen when local political institutions are put in cold storage. Without the structures presented by the existence of a devolved administration and the public platform this provides, electoral parties tend to stagnate and even wither. Sinn Féin and the DUP are well aware of what happened to the Ulster Unionist Party and the SDLP as a result of the prolonged period of direct rule during the 1980s. Both parties, however, are caught in a bind. Stormont as now constituted allows them to exert a certain amount of influence but grants no real power. The recent ruling by Britain’s Supreme Court in relation to article 50 of the Treaty on European Union—i.e. Brexit—made this painfully clear when it “unanimously ruled that devolved administrations did not need to be consulted and did not have a right to veto Article 50 . . .” It might well have added that, deprived, as it is, of fiscal and political authority, this applies to all other matters of significance coming before the Assembly. Making matters worse is the fact that those who have administered the six counties over the past ten years have no concrete plan for improving the situation. On the contrary, they have found themselves in the unenviable position of having to manage their responsibilities within parameters dictated by governments in London. How impoverished their response to this has been is evidenced by feeble initiatives such as the proposed reduction in corporation tax and appeals by the first and deputy first ministers to foreign transnationals to come and exploit the North’s low-wage economy. Moreover, it now appears that the absence of meaningful control over the economy may have played a significant part in the RHI (or “cash for ash”) scandal. Approximately 45 per cent of this grant was allocated to the poultry industry.¹ An impartial observer could be forgiven for thinking that this was, in effect, a disguised subsidy for a low-tech industry that, unsupported, might easily have been undermined by competition from abroad. Interestingly, the scheme’s attraction for poultry farmers was reported by the News Letter as far back as August 2014,² a fact that may require answers from the then minister for agriculture, Michelle O’Neill. Whatever conclusion will eventually be drawn from inquiries into this affair, it exposes inherent weaknesses in Stormont’s political and economic structures. The northern political entity is a peripheral region of the United Kingdom, locked in to London’s political and economic orbit. Unable to chart its own course, Northern Ireland is reduced to operating an opportunist economic policy, regulated and contaminated through the mean practising of sectarian politics. Therefore, while the Assembly and the Executive may eventually be restored, they will continue to huff and puff and do little to improve the dismal lot of the region’s working class. As with so many other states failed by a colonial past and contemporary capitalism, the North needs a transformative strategy. This requires frankness, honesty, and a willingness to contemplate options that will not please everyone. The northern state, as now constituted, is a failure and has to be replaced. That such a change will come about is no longer in doubt. The fall-out from Brexit, Scottish disenchantment with London and changing demographics are among the factors that guarantee this. Simply waiting for events to take their course, however, is not an option in the volatile political arena that is Northern Ireland. The only responsible approach is to make sure that change happens under the best possible conditions and with maximum support from within the working class. To do so it will be necessary to introduce a programme that demonstrates (even if it cannot be immediately implemented) a clear and reasonable path towards a new and better society. Core issues detrimentally affecting working-class communities have to be given priority and solutions identified over the short, medium and long term. It doesn’t take long to list problem areas that would form the basis of a transformative programme. Just as in the Republic, there is a homeless and rental-housing crisis in the North that can only be addressed by a comprehensive public housing strategy. The creeping privatisation of the National Health Service has to be halted and rolled back. Workers’ rights need defining, asserting, and defending. Adequate care for the aged must be made a priority. And the greatest stain of all—ubiquitous food banks in 21st-century Northern Ireland³—must be addressed and the need for them ended for all time. To implement such a strategy it will be necessary to build a movement around progressive forces and identify a methodology for engaging with the situation. Let’s be honest: this won’t be easy, but the alternative is to do nothing while tolerating existing failure, as we wait for the situation to inevitably get worse. As socialists, however, we believe we can succeed in this endeavour, because we always exercise “optimism of the will,” even in the North of Ireland. 1. Conor Macauley, “RHI scandal: Locations of RHI boilers revealed to BBC,” BBC News, 17 January 2017 (http://bbc.in/2k5EUju). 2. Future of farming appears to be “Brites,” Farming Life, 22 August 2014 (http://bit.ly/2kBd52i). Fianna Fail continues to support the Fine Gael led coalition in spite of having done a U-turn on water charges. Their move against Uisce Eireann was more than simple opportunism. On one hand it certainly did indicate a party preparing for the next general election by endeavoring to clear as many obstacles from its path as possible. Equally so, and this is important, Fianna Fail populists have recognised that there is a changed political climate in the Republic. They may not, though, have realised that it is more than a passing phase. The 2010 financial collapse and subsequent leeching of the 26-Counties' people by the Troika has revealed a powerful socio-political constituency at odds with the status quo. What is not obvious though, is the direction this movement is heading. Politics in the South of Ireland was dominated until recently by three conservative political parties and no matter how much some of us despaired, the people appeared content with the arrangement. No longer though. Fianna Fail’s somersault actually went some way towards underlining this fact. Thanks in no small measure to Micheál Martin’s Pauline conversion, the fate of the water tax is sealed for the time being and few of its opponents can have failed to recognise this. In spite of that, last month saw one of the largest protest demonstrations in Dublin this year. Thousands took to the streets demanding the definitive abolition of a virtually defunct tax. Even allowing for Indo hype or Garda overreaction, this is a remarkable situation with a government seemingly frightened by its own citizens. Nor is this a localised Irish phenomenon that may exhaust itself through the granting of limited concessions. Similar sentiments are being expressed across Europe and North America. So disenchanted have people become with the outworking of contemporary capitalism that even powerful representatives of the global elite are openly concerned. Their worries were summarised by a recent Financial Times editorial which stated that, 'supporters of open markets and liberal values are acutely aware that they are facing a political backlash that threatens the current international order.... Christine Lagarde spoke of the “ground swell of discontent” felt in many countries with growing inequality in income wealth and opportunity'. The article continued, mentioning other concerned members of the global ruling elite including EU bosses Donald Tusk and Mario Draghi. Needless to say the money people’s newspaper only offered free market solutions. This belief in free-market economics, long shared also by social democrats, is now being challenged to a greater extent than at any time since the 1930s. Events in England, with the consolidation of Jeremy Corbyn's position at the head of Britain's Labour Party, is further proof of what is happening. Developments within that party are instructive, exciting even and surely to be welcomed in the wider context in spite of their limited social democratic agenda. They do nevertheless have the potential to be somewhat misleading in the sense that under Irish conditions, there cannot be an exact replication of the Corbyn campaign. As a result of extensive 19th century industrialisation and the growth of the trade union movement, there has existed a mass working-class party (albeit centre social democrat and bourgeois led) in Britain since the early 1900s. There is no similar mass organisation in Ireland and we would do well to recognise this. For well known historical reasons, the political left of centre in Ireland is not dominated by any one party as is the case in the UK. Nor has the modern Irish working class a shared folk memory identical to that which still influences many British working class communities. Ireland’s history of anti-colonial struggle coupled with what for decades was a predominantly rural population has helped shape its grassroots political movements, resulting in several schools of thought. Consequently the strong radical constituency that has emerged over the last few years in Ireland is influenced by a number of different currents as evidenced by those participating in the recent Right to Water demonstration. Without question it is a predominantly working class movement with a healthy trade union input, an obvious socialist and republican participation and a non-party community involvement. While clearly a healthy and progressive development, there is minimum consensus around a shared programme, how it might be implemented and by whom. Agreement around a limited programme such as the Right to Change principles is a useful first step but has weaknesses when inevitably faced by major issues such as membership of the European Union, rejection of finance imperialism or partition of the island. And let us be honest with each other, these are important issues that cannot be ignored and will eventually either split a movement or prevent it unifying. Republicans, for example, will continue to reject partition and socialists will remain hostile to EU membership. Until there is agreement around these contentious but vital issues, it is premature to talk of a new mass political party of the working class. On the other hand, ignoring these questions in an attempt to maintain a façade of unity will at best result in creating the type of compromised and flawed entity that is Syriza. However, there is no reason for despondency or lethargy. Significant progress has been made and conditions are favourable for positive advancement by the working class. What is required is to identify a vehicle that will allow for maximum cooperation while simultaneously facilitating and promoting intensive discussion and negotiation around the formulation and implementation of a programme for the establishment of a socialist republic. We already have the Right to Change as a vehicle with a proven record of promoting cooperation. More, however is required in terms of organisational and policy consensus. In this age of modern communications with continuous online activity among other helpful features, there is every opportunity to carry out the extensive political education and discussion needed to complete the tasks. At the risk of echoing the afore mentioned U-turners; significant progress made but much remains to be acomplished. How often have we heard the phrase from Marx's ‘Eighteenth Brumaire of Louis Napoleon’, that history repeats itself ‘... first as tragedy, then as farce’? That the axiom is overused is hardly surprising since it has been proven accurate so often and rarely more so than when applied to the current administration in Stormont. Once we were afflicted with an uncompromising Unionist regime that governed the six counties with scant regard for democracy and creating misery for many. In its place we now have an administration that appears intent, instead, on making itself a byword for banality and ridicule. The Lords Craig and Brookeborough must be turning in their marble tombs as the state they created is now home to what might charitably be described as a political circus. For pure farce it would be difficult to out-do the most recent brouhaha following revelations that a Sinn Fein MLA had coached flag waving loyalist Jamie Bryson prior to the young unionist giving evidence at a committee hearing investigating the Nama scandal. The only redeeming feature of the affair was the MLA’s immediate and exemplary resignation when found to have transgressed; an act of integrity almost unprecedented in northern political life where a mule-headed refusal to accept blame for any misconduct is more often the norm. As well as the titillation provided by the Namagate coaching scandal, Stormont’s second coming contributes daily to the surrealism that surrounds Assembly business, indicating that it is more about optics than substance. Deprived of overall or full authority, due in large part to the absence of fiscal control, the Assembly (or the Executive at any rate) is now striving to maintain its existence at all costs, often paying less attention to living conditions for its electorate than to its own fortunes. One result of this is that the two main parties have agreed on a curious modus vivendi that provides for a distinctly Northern Irish version of bicameralism. Instead of having two chambers, Stormont has effectively two arenas, one for designated areas of public disagreement and the other providing for an underlying consensus on economic policy. Readers of this newspaper hardly need reminding of the often-reported areas of disagreement in the North. Less obvious perhaps is the extent to which a neoliberal consensus underpinning the political institutions has led to a virtual policy convergence on economic matters. 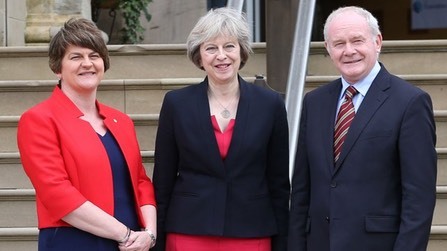 Just how close the two main parties are in these terms was highlighted recently in a joint letter from First Minster Arlene Foster and Deputy First Minister Martin McGuinness to British Prime Minister Theresa May. In spite of angry denials, the First Minster had apparently performed a dramatic u-turn in relation to the European Union. Notwithstanding her enthusiastic support (and that of her party) for the Brexit campaign to leave the EU, Ms Foster has, in the letter to Downing Street, shifted her position on Brussels to one that appears not unlike that of Sinn Fein. The extent of the DUP leader’s about-turn is evidenced by no less than four references in the letter to the benefits supposedly accruing to Northern Ireland from EU membership. While the First Minister was being ridiculed by her political opponents and some media outlets for her remarkable political somersault, the Deputy First Minister’s party had managed to perform a no less dexterous manoeuvre albeit one that drew much less public attention. As well as reversing its long-standing opposition to the free-market driven European Union, the letter to Theresa appears to indicate that Sinn Fein has adopted a pro-business position vis-à-vis workers and wages. The jointly agreed and signed communiqué contains a request for policies that, it states, should be, ‘…sufficiently flexible to allow access to unskilled as well as highly skilled labour’. Elaborating on this point, the letter said that this was necessary because employers in the private and public sectors are heavily dependent on EU and other migrant labour. Whether Sinn Fein care to admit it or not, there is nothing transformative or progressive about this stance. There is little doubt that this will not play out as an enlightened appeal to welcome workers from abroad. In Northern Ireland's depressed economy this is a strategy for lowering wages that are already among the lowest in the United Kingdom. Both parties in the Stormont executive would probably claim, with some little justification, that they are restricted by the terms of the 1998 Northern Ireland Act (i.e. devolved powers) and the amount in their annual block grant from London. Nevertheless this is to ignore the fact that there are several areas such as health, housing and economic development (among other areas) over which the local assembly has authority. Significant improvements could be made in all of these areas were it not for this unspoken but undisguised neoliberal consensus. Take just one area, that of the National Health Service in the Six-Counties. Even allowing for financial restrictions imposed by the finite block grant, there is no good reason why Stormont doesn't act to remove privatisation from this service. Nor is this a purely ideologically inspired suggestion. Late last year BBC in Belfast reported that care services for the elderly in their home environment were at breaking point. The report makes for grim reading with one care worker reporting that all too often they can only spend a bare 15 minutes per day with their elderly and often weak patients. Disturbingly, the report also stated that there are more than 300 local private domiciliary contractors in Northern Ireland while care workers experienced the lowest average hourly rate paid for domiciliary care in the UK. This surely begs the question, what need is served by having 300 private middlemen (or any middlemen) and at what cost to patients and care workers? Supporters of the Executive will claim that this is the price to be paid for maintaining the political institutions in the North and implying by extension, a necessary part of maintaining peace. However well intentioned, this is a mistaken argument since the current status quo in Stormont is above all else, preserving sectarianised institutions serving a failing state. Ultimately the solution to this problem rests in replacing the flawed and failed institutions on both sides of the border with the establishment of a workers republic. Nevertheless, this should not be interpreted to mean that we have to postpone challenging the Northern Executive's neoliberal programme in the here and now. Building a workers state is not something that comes about spontaneously or without struggle. Highlighting the flaws within capitalism and campaigning to overcome, even some of them, are important aspects of that struggle. The northern state’s political institutions may indeed have become something of a farce but the real tragedy would be if we fail to expose them and or hesitate to organise resistance to these injustices. An important first step in what we may well come to describe as our “new departure”—this was how the recent summer school of the Peadar O’Donnell Socialist Republican Forum was described by one of the participants. Cautioning against a pedantic comparison with historical events, she pointed to the coming together of hitherto divergent currents in an effort to advance the cause of a workers’ republic. Communists, republicans and socialists from around Ireland gathered last month in Co. Tyrone to take part in the event. 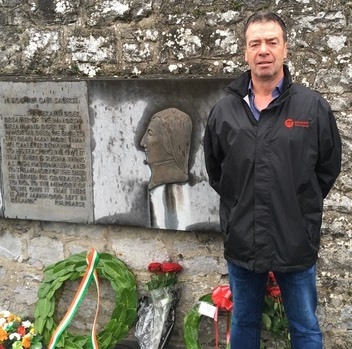 While the forum organised a very successful celebration of the 1916 Rising earlier this year, the summer school was by far its most ambitious and also its most successful happening to date. In spite of a full and often challenging agenda, all those attending agreed that the time spent had been worth while, productive and, best of all, greatly encouraging. Speaking during a break in the schedule, Eugene McCartan said that the purpose of the forum is to provide a vehicle to facilitate informed political discussion.¹ This, he said, will hopefully allow for a consensus to emerge on the interpretation of socialist republicanism that encourages the coming together of people prepared to strive for the establishment of a workers’ republic. From its formation, the forum has been clear that it draws inspiration and insight from the Republican Congress of the 1930s. Nevertheless it has also proceeded with the clear understanding that the world does not stand still, and that any analysis has to be grounded in contemporary reality. Acting in this light, the summer school agenda included an exploration of present-day imperialism, socialist republicanism, women’s rights, damaging trade agreements, the privatisation of health services, and the need to effectively communicate the socialist republican message. Demonstrating the power of effectively communicating a contemporary message, Patricia Campbell opened the summer school with an incisive presentation on the damaging effect of privatisation on health services, north and south. Drawing on her many years of nursing experience, she illustrated how imposing private companies on the health service diverts resources from patient to shareholder, with a particularly devastating effect on the elderly. The opening session was followed by an outline (coupled with a facilitated discussion) of contemporary imperialism, with an emphasis on its financial manifestation and therefore illustrating the injurious role played by transnationals as well as by Britain, the EU, and the United States. The next session was a workshop examining the reality and perceptions (or misconceptions) of socialist republicanism today. Overseen by Frankie Quinn, this sitting utilised to the full the forum’s desire to practise a participative rather than didactic method of engagement. With the aid of a series of thought-provoking questions, participants explored socialist republicanism honestly and robustly, sparing no sensitivities. Eoghan Ó Néill, author of Trading Away Democracy: How TTIP and Other Trade Agreements Will Destroy People’s Rights, guided the participants through a workshop demonstrating the threat posed by a number of impending trade agreements. 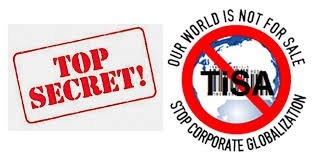 He pointed to the dangerous Transatlantic Trade and Investment Partnership (TTIP) but also the lesser-known, although no less harmful, Comprehensive Economic and Trade Agreement (CETA) between the EU and Canada. Valerie Hayes brought the second day to an end with a workshop examining the lack of women’s rights in Ireland, north and south. She drew a comparison between the reactionary attitudes shared by right-wing groups in both jurisdictions and demonstrated how ingrained conservative attitudes towards women also help to reinforce the unhealthy status quo. Finally, the summer school devoted time to the question of organisation. This is a matter of huge significance, as ill-conceived structures are inimical to progress. Several speakers emphasised the need to reject political sectarianism and resist the temptation of a selfish form of “party-building” that excludes others. There was broad agreement, therefore, that it is essential to cater for and encourage maximum co-operation among different political entities on a set of shared principles that address current concerns. Coupled with these long-standing harmful economic conditions are recent developments that are now creating circumstances demanding answers and simultaneously offering a fresh opportunity to the left. The working out of the most recent crisis within capitalism, and resistance to its imposition of a bail-out and austerity on Ireland, has altered the party-political landscape in the Republic. More recently in the North the result of the EU referendum has posed a series of difficult questions for the ruling elite throughout Ireland. The larger pro-EU parties in both jurisdictions confine their arguments to whether there would be a “hard” or a “soft” border, without asking why there is a border at all. Moreover, they have failed entirely to address the impact of TTIP on workers and working-class communities within the EU. In the light of this, not only did the forum’s summer school in Co. Tyrone cover relevant issues but its convening was timely. Moreover, by drawing together previously divergent currents in a dialogue on issues of shared concern, the forum is in step with other, similar initiatives. A vibrant initiative, for example, is under way among the most progressive elements of the trade union movement to examine how best to promote the interests of Ireland’s working class. 2. Carl O’Brien, “Ireland at risk of reaching US levels of income inequality, says study,” Irish Times, 16 February 2015. 3. Ambrose Evans-Pritchard, “IMF admits disastrous love affair with the euro and apologises for the immolation of Greece,” Daily Telegraph, 28 July 2016.